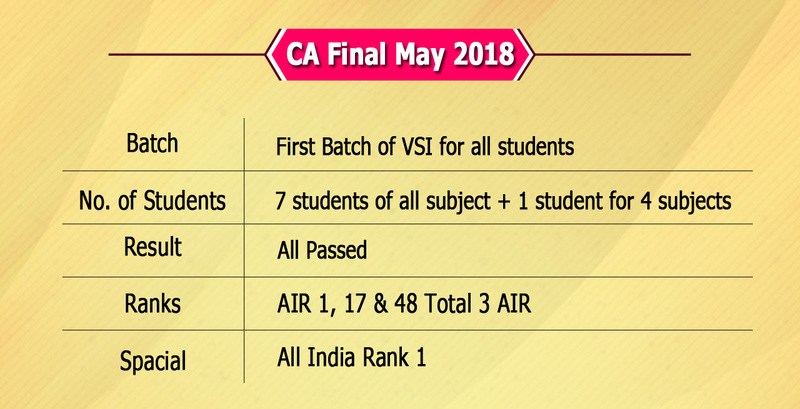 Once again VSI has proven that it is the best institute for CA throughout India by giving All India First Rank in CA Final. VSI has beaten its own record of three AIR in the past six years which indicates that VSI is the best CA Coaching Institute. Again VSI has proven that nothing is impossible if studied in proper guidance by giving All India First Rank in CA Final after giving hat-trick of AIR-1 in CA IPCC. Where everyone is running just to crack this exam, VSI is preparing each and every student for the All India Rank. It says that “Until and unless your dreams are bigger, you could not plan them to achieve. VSI spreads a positive attitude among students which motivates them to be India’s next CA topper. The director of Vidya Sagar Institute R.C.Sharma Sir said that if students study with a proper planning and under proper guidance then every student even an average student can also be India’s next Topper in CA Final Examination. Join only if you are passionate about CA , want to be a Ranker & Pass Exam in 1st Attempt. You Can Join VSI in 3 Ways. How VSI Gives Best Results in CA?